Well, I know it is a bit out of date. And I know I did a Not Me post on Brianna's birthday. But let us remember that the main point of my blog is to record the important moments. I have had so many things I wanted to post about that I never got around to posting about Brianna's birthday for those loved ones who could not be here with us. When Brianna was getting ready to turn three, she adored balloons of any size, shape or color. We had no extra money in those days so it became a real treat for her to get a balloon at the grocery store once in a while. For her third birthday, I decided that I would get a bunch of balloons. And just before she woke up, I would sneak in her room and fill her crib with them. I did and she loved it! Ever since, each birthday in our house has begun with a balloon attack in your bed. It is always followed by a raucous of a fight with balloons and squeals going every which way. The battle almost always ends with someone getting hurt. You would think we'd learn! But no. We just spread the cheer as much as we can. One year we filled my brother's little car with black balloons. He has to commute a very long way in very bad traffic. To avoid rush hour he gets up around four am to go to work. He went out to the car to leave and of course it was still dark. So dark, in fact, that the black balloons were all but invisible. He was trying to get in his car and couldn't figure out what was in his way! When he arrived at his office that morning, a florist delivered 30 more black balloons to his office. Now, the trouble with Brianna is that she rises before the other kids. And she is a very light sleeper. For the last few years we've not been able to get her before she got us. We devised a plan to surprise her. We got up and went about our morning routine as if it was no special day. Brianna, expecting us to come and jump on her, laid in bed pretending to be asleep. After we made breakfast and finished chores, yes we made her lay there at least a good hour, I told Nathaniel to go to her and deliver a message. "Brianna you had better get up now. Mama is quite upset that you have not gotten up to do your chores and everyone is ready to sit to breakfast. You are in big trouble!" In the kitchen, we had our balloons and were hiding behind the cupboard. Now, the only problem is that everyone got dead quiet. Because they wanted to surprise her. Just about the time that Brianna was coming down the hall and was ready to round the corner it occurred to me that she would for sure know something was up if the house was quiet just before breakfast! Just the same, I think she was a little shocked when we all pounced on her as she came into the kitchen. For birthdays, the person of honor gets to choose the movie and pizza for their dish night. Brianna chose The Princess Bride and shrimp pizza. I never cared for this movie in the past and the children would usually watch it when I wasn't around but I could not very well not be here for Brianna's night. At the end of the movie I was surprised that I enjoyed it very much this time around. Now, I wonder if that means that my taste is improving or if it means that I am declining to a lower level of good quality entertainment? Either way, it was a hit all around. Since the entire family enjoys fencing, the sword fighting scenes were a favorite. Ever since, Samuel keeps asking me to play out the part when the Buttercup jumps in the water and the electric eels are trying to get her. That apparently was his favorite part. In case you are wondering, I am Buttercup. Needless to say, the shrimp pizza was delicious. The children don't have a whole lot of kids their own age around that they consider friends, so instead of birthday parties we give the option of doing an activity of their choice. Brianna chose to spend the day hanging out at the pool. We swam, played cards and were just generally lazy all day. She pronounced it a successful birthday celebration. In the evening, my parents joined us for dinner. She was delighted that they gave her the suitcase she has been saving up for. If you'd like to know about her current fascination with luggage you can read about it here. We had an extra special guest come as well. My nephew Brandon and Brianna share the same birthday. Brandon turned 18 this year. He is three months older than my Kaitlin. Because of his father's military service, Brandon's mom was here in Maryland and raising Brandon alone while attending college and working. For the first 18 months, he spent most days, and often nights, with Kaitlin and I. During that time, they became quite close and were almost brother and sister. When his mother, Ann, and my brother, Frank, married and moved to a base in New Jersey, I moved there and cared for Brandon until about his second birthday. As you can imagine, they came to be close friends. About the time the two were eight, Brandon's parents divorced and Frank came to live with us at the same time because his commitment to service in the military was over. Brandon spent many holidays, weekends and summers with us after that until about three years ago. He was a special part of our family. Circumstances have limited the time we got to see him to about 5 visits in the time since. We have missed him and are so thrilled to have more opportunity to see him now that he is graduated and driving on his own. It was fun to get some pictures of the cousins together. The last ones we have, there were far less Wachter children! Now for those who know us well, I know you are wondering what Brianna chose for her birthday food. If you would like to know how important food is to our birthday celebrations you can read about it here. Breakfast- Lox and bagels, orange juice and grapes. For her gift, I found this great patent leather bag at Lands End. It was an insane price of around $80 at the beginning of the season. I was amazed to get it for $20 by waiting until August to buy it. I had a blast hunting for green things to fill it. Stationary, patent leather slides, pajamas, camisoles, socks, unmentionables, sunglasses, hair stuff, office supplies and some videos went in, too, just for kicks. We sat poolside laughing and visiting until we couldn't keep the bugs away or our eyes open any longer. It was indeed a happy day! 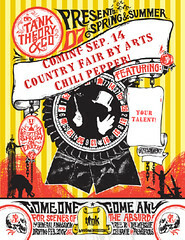 Don't forget to click on the button to read all about the country fair coming to my blog September 14th! What a fun time. That is really neat that you do that for their birthday. I had a friend in High School that their family did that too. Whatever they wanted to do or eat on that day it was up to them. Sure makes the birthday person feel special. Great pictures. That looked like soooo much fun! I guess cuz they weren't so special when I was a kid, I just don't know how special they COULD be. To us, they're almost just another day with a tad bit of fun thrown in. I gotta get better at that! Chili...you are something else! I don't know what...but something. Hehe. Your heart is all over this blog, little balloon lady! You sound like a barrel of fun. Your family is blessed to have you, and I think even God is blessed when He watches your cute little antics! It sounds like she had an amazing birthday! I love the balloon tradition-what a great way to make birthdays special! You did a great job on her gift! I would love to get a bag filled with great stuff! I enjoyed reading every part of this post. I think birthdays and fun and I liked hearing your traditions. 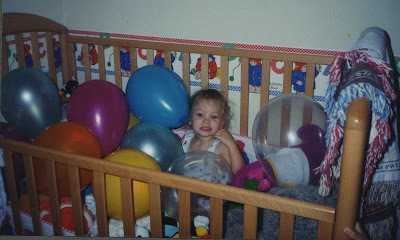 She is adorable surrounded by a crib full of balloons. Now I am yearning for some strawberry shortcake. Happy Birthday to your sweet daugther. What a fun tradition...the balloons! It looked like you a had a wonderful day of celebration! Thank you too for the award you extended to me...thank you!! What a lovely day! Looks like she had a very happy birthday and I love the balloon tradition! To cute! I love the balloon pic and what a great tradition - balloons are just so happy. Looks like she had a wonderful birthday. Thank you for sharing Brianna's birthday with all of us. I love the balloon celebration! We start ours off with blowing bubbles! It makes a great way to keep family traditions alive. I love the bag that you picked up and filled with all kinds of cute things perfect for a birthday girl to enjoy. awwww...Mom...you have always done such a good job of making birthdays special! How special - out of date or not!! Looks like you all had a wonderful time and what a CUTE present!! Great thinking mom!! What a wonderful birthday celebration! :) It looks like so much fun!